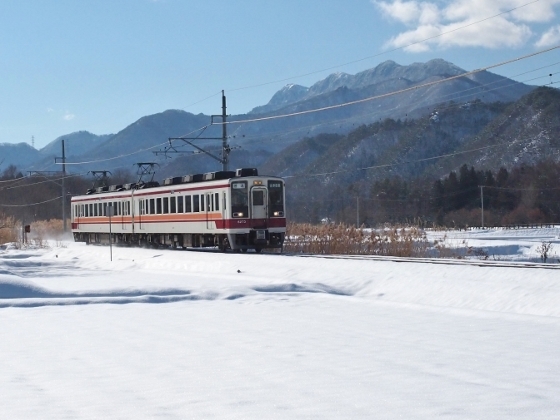 Today I visited Minamiaizu covered with snow by taking Aizu Railway from Aizuwakamatsu to Nakaarai Station. 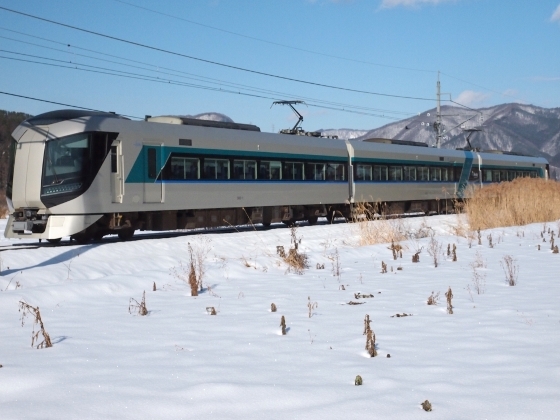 Photo shows a limited express Revaty running through snow covered fields under a winter blue sky. 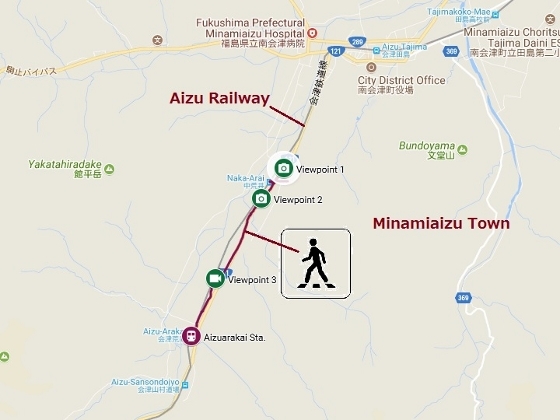 The train was from Asakusa, Tokyo headed for Aizutazima, the center of Minamiaizu Town. 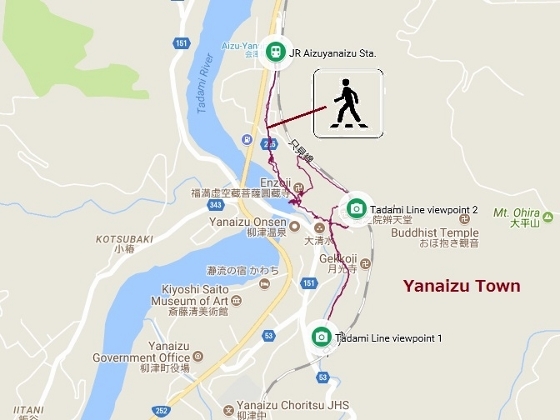 The location of the photo was between Nakaarai and Aizutazima shown as viewpoint 1 in the map below. Then I walked toward south and took other pictures as shown above, a local train and another Revaty bound for Asakusa, at viewpoint 2. 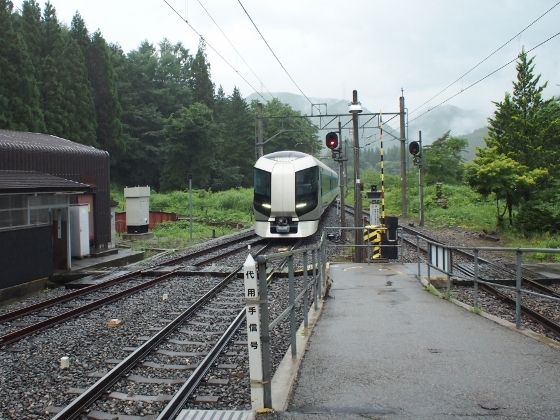 I walked further south to near Aizuarakai Station (viewpoint 3) and shot a rapid train called Aizu Mount Express as shown above. Finally, I took a short video of another Revaty from Asakusa at the same viewpoint 3, as shown above. 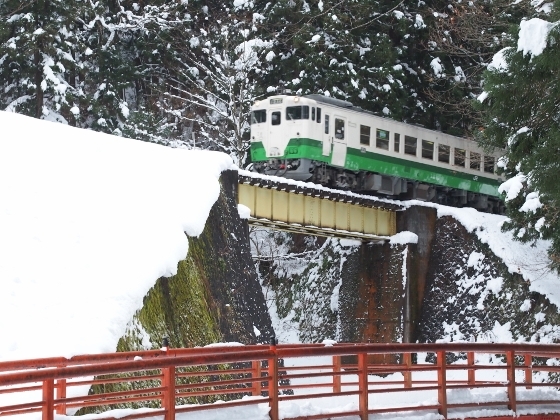 I think you can feel the image of the train running. 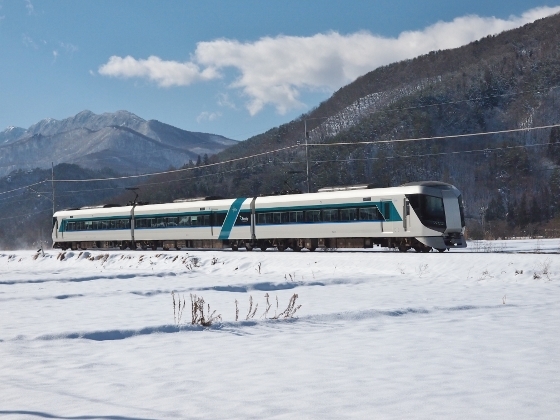 Today I traveled to Yanaizu Town by JR Tadami Line to watch train view in snow. Photo above was a view in the town from viewpoint 1 in the map below. 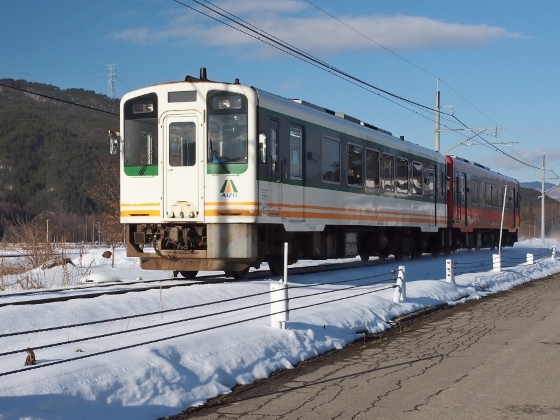 The location was about 40-minute walk from JR Aizuyanaizu Station. 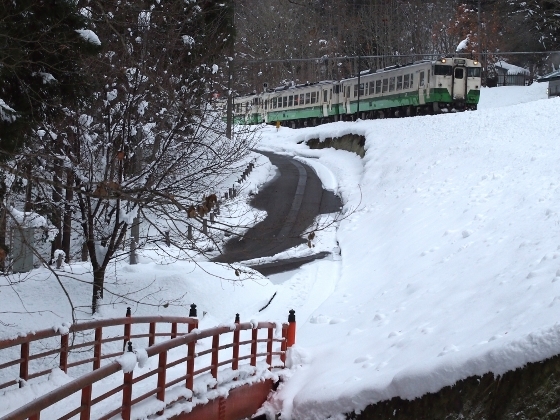 Tadami Line also ran through the back yard of historic Fukumankokuzo-Bosatsu Enzoji Temple in the town. Photos above show the train passing near the red bridge in the temple precinct. The location viewpoint 2 was shown in the map below. On the way back home, I got off at Nanukamachi Station and walked through the traditional streets. I first stopped at Yamada Momen-orimoto as shown above, a traditional spinning factory of cotton cloth called “Aizumomen”, which started more than 100 years ago. The factory also has its small shop of wears and accessories made from the cotton cloth. Next, I stopped at Yamada Mingei workshop as shown above located just a block away. It was a traditional handicraft workshop of Okiagarikoboshi, a self-straighten up doll special for Aizu region. 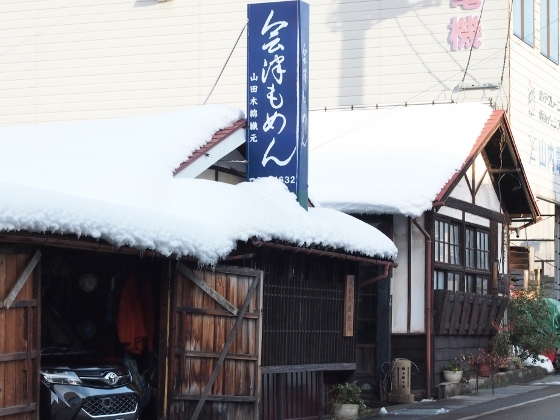 The shop is said to be the origin of all the similar workshops in Aizu and is dedicated to totally handmade, while some other workshops use machines in these days. 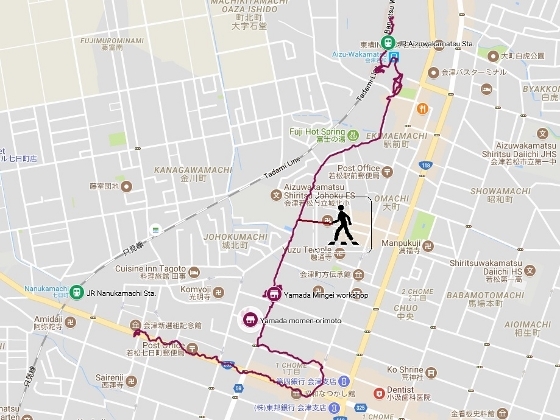 It took less than 2 hours walking through the street between Nanukamachi and Aizuwakamatsu Station stopping and shopping at the spinning factory and the handicraft workshop. Locations are shown in the second map below. 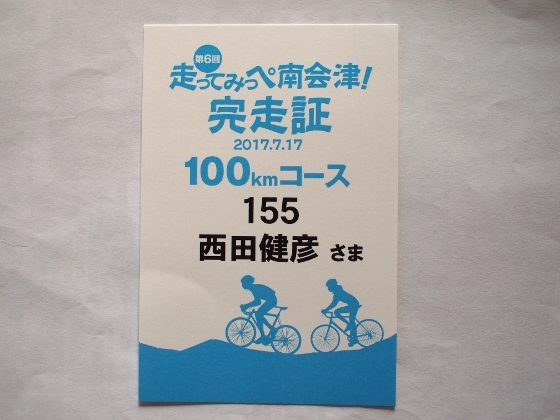 I participated in a cycling event “Hashitte-mippe” or “let’s go cycling” held in Minamiaizu Town on July 17th, 2017 which was a national holiday “Marine Day”. 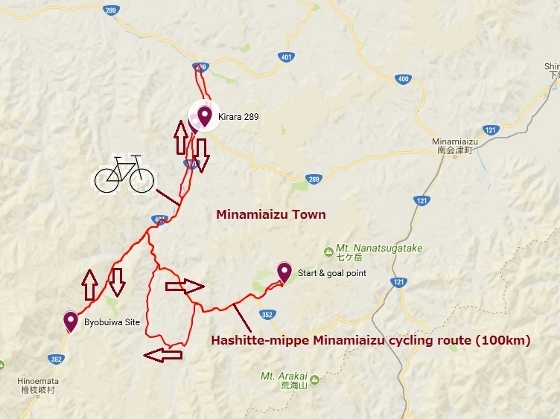 The route covered western part of the town area, which was mostly mountainous with green forests and rivers making it really refreshing to ride. About 700 cycling fans gathered for the event from across Japan including many from Tokyo metropolitan area. 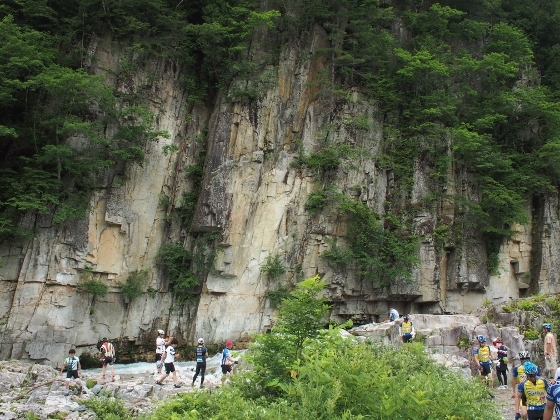 A photo above shows Byobuiwa Site with rocky landscape along the upper stream of the Ina River. The site was located at the southwestern end of the route near the border with Hinoemata Village. We had a light lunch and a short break on the rock at this aid station. 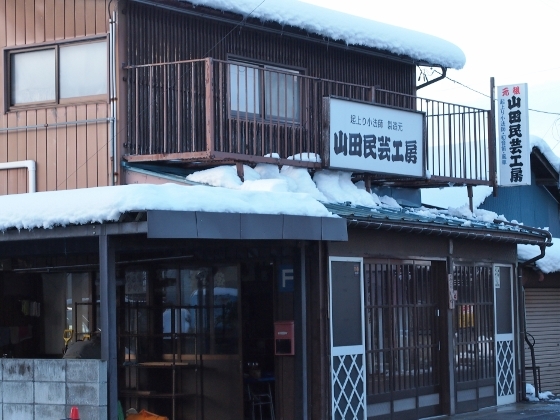 A photo above shows a scene just before the start at Takatsue ski resort located 950m above sea level. Major part of the cycling route ran south to north along the Ina River which was beautiful as shown above. 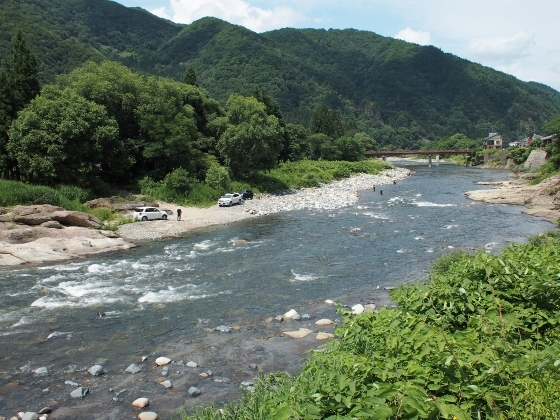 Many anglers enjoyed ayu fishing soaking into the river. 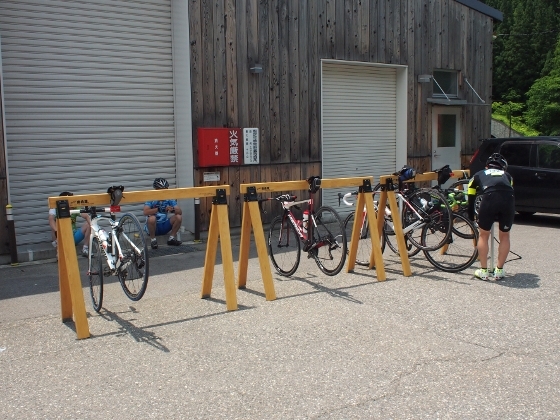 At a roadside station “Kirara 289” located along national Route 289 in the northwestern part of the town, new wooden bike stands which were made from local wood were installed as shown above. Luckily I could successfully complete the course and got the certificate as shown above. The last 3km hill climb to the goal was extremely hard for me being already exhausted. 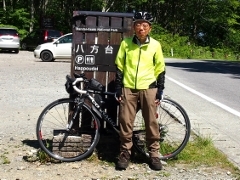 The day before, I packed my bike and traveled to Aizukogen-0zeguchi Station which was the nearest to the event site, although it still took another 18km bike tour including a mountain pass to get to the site. 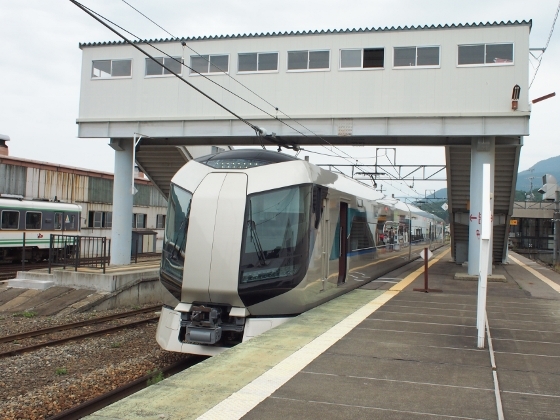 I was lucky that I could experience a new limited express train “Revaty” as shown above between Aizutajima and Aizukogen-Ozeguchi Station introduced from just last April. 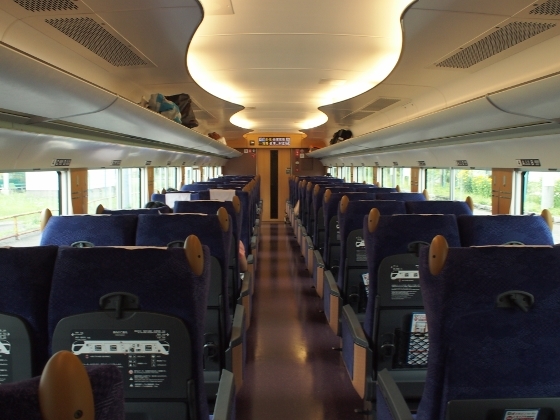 The limited express train was comfortable and required no extra charge between the two stations. Also on return trip, I could again take the limited express Revaty which came from Asakusa, Tokyo. 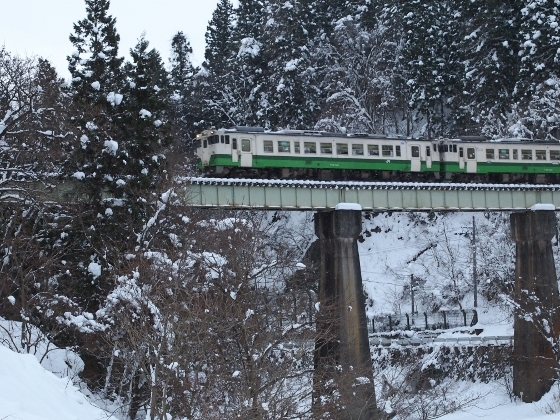 Photo above shows the train coming into Aizukogen-Ozeguchi Station where I got on.